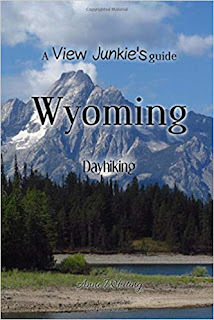 Full disclosure: the author of A View Junkie's Guide: Wyoming Dayhiking contacted me several months ago with regards to using some of my photos for her upcoming book. No compensation was exchanged for use of these photos; however, Anne recently sent me a copy of the book. I voluntarily decided to review it here. A View Junkie's Guide: Wyoming Dayhiking takes hikers to some of the best scenery Wyoming has to offer, including Grand Teton and Yellowstone national parks, as well as the Black Hills, Snowy Range, Wind River, Gros Venture and Absaroka mountains. This is the third installment in a series of hiking guides by author Anne Whiting, who has also published trail guides for Colorado and Washington state. Anne’s newest edition covers 48 individual trails, and over 175 hike options. The book is geared towards novice, moderate and adventurous hikers who enjoy spectacular views. As you might expect from the title of the book, Anne seeks out trails that offer amazing scenery. As she points out in her Introduction, many trail guides tend to spend an inordinate amount of time discussing the flora, fauna, geology and local history of the trails they cover. Not in this book. Anne is focused on the views hikers will see along each of the routes she covers in her book. Readers will appreciate the comprehensive trail directory near the beginning of the book, which is sorted by the regions covered in the state. Within each national park or mountain range are the main trails, with the various options hikers can take depending on mileage or presence of loop options. Each hike in this directory contains key data points, such as trail length, total elevation gain, as well as Anne’s ranking with regards to difficulty level, solitude and of course, the overall view rating. There’s also a page number listed next to each hike which tells the reader where to turn for detailed information on each hike. Each hike description includes directions, a trail map, key GPS coordinates, as well as photos of the scenery hikers will enjoy along the route. Anne also provides key information on trail conditions that could impact hikers. For example, in many areas of Wyoming hikers will be traveling through bear country. Anne lets readers know about certain trails that pass through prime bear habitat. In other places she warns about sections of trail where snow that can linger well into the summer. As a history enthusiast, I really enjoyed the trail trivia section provided near the end of each hike description. As already mentioned, A View Junkie's Guide: Wyoming Dayhiking includes hikes for all levels of experience: from very short strolls, to strenuous all-day hikes. A handful of hikes covered in the book would actually be more conducive as backpacking trips, though they could be done in one-day for super-fit hikers. A prime example of this is the spectacular 19.6-mile Cascade Canyon – Paintbrush Canyon Loop in Grand Teton National Park. Another example is the 20-mile Cirque of Towers hike in the Wind River Range, a destination that’s been on my bucket list since reading about it in Backpacker Magazine many, many moons ago. If your only intention is to visit Grand Teton and Yellowstone national parks, this book will serve you quite well, as it covers most of the best hikes in these parks, as well as several other options in the national forests that border the two parks. These hikes will offer you much more solitude if you’re visiting these popular parks during the peak tourist season. With the exception of the Bighorn Mountains in north-central Wyoming, the book covers the premier hikes in each of the major mountain ranges in the state. If you’ve only visited Grand Teton and Yellowstone national parks in the past, this book will provide the inspiration to get out and explore the rest of this truly beautiful state. I can say with certainty that Anne’s book has expanded my bucket list of hikes to include the Highline Trail in the Wind River Range, as well as the Medicine Bow Peak Loop in the Snowy Range of southeast Wyoming. For more information and to purchase the book on Amazon, please click here. Park officials plan to invite the public to preview the parkway by foot, if conditions permit, before it opens to motorists. This pedestrian opportunity is tentatively planned for Thursday, November 8 during the morning hours utilizing a shuttle operation. More details will be provided by Friday, November 2 to help prepare people for this special opportunity. Great Smoky Mountains National Park officials announced the reopening of Bull Head Trail and Sugarland Mountain Trail on Friday, October 26. Both of these trails extend from the highest peaks in the park to the lower elevations, providing incredible opportunities for hikers to enjoy fall colors over the next few weeks. These trails have been closed since November 2016 due to damage resulting from the wind event and fire damage associated with the Chimney Tops 2 Fire. Park trail crews spent several weeks this year repairing over 500 feet of trail tread, cutting 758 downed trees, removing over 20 large root-balls and boulders, and repairing and replacing 53 trail drainage structures. Both trails pass through areas in the park which burned at a high intensity, including some sections where the entire tree canopy was lost. Hikers should remain alert for hazards such as loose rocks and falling trees or limbs and should avoid hiking these trails during and after high wind or rain events. At all times, hikers should avoid lingering around standing dead trees. The Friends of the Smokies provided $195,000 for this rehabilitation. The donation was made possible thanks to the generous support of donors from across the country who responded to help fund park recovery needs following the wildfire. Hiking-for-Her.com Publishes Review of "Ramble On: A History of Hiking"
The author of Hiking-for-Her.com recently published her personal take on my new book, Ramble On: A History of Hiking. As you might expect from the title of her website, Hiking-for-Her.com is a website dedicated to female hikers. In her fairly extensive write-up, the author offered this blurb as one of her assessments of the book: "It was delightful to see the topic examined through a gender inclusive lens wherever possible." She concluded her review by stating: "To sum up, this book is a fast read. It keeps you turning the pages to soak up the next interesting topic. 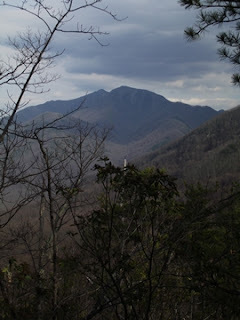 Lots of great hiking facts and stories keep you entertained." Friends of Great Smoky Mountains National Park and Great Smoky Mountains Association, two of the national park’s oldest and most profitable partners, have shared space at the Sevierville Visitor Center on Winfield Dunn Parkway near Interstate 40 for more than a decade. GSMA has operated a retail space on the ground level, where it offers visitors educational items designed to enrich their Smoky Mountain experience, while FOTS staff occupied office space directly above. However, the organizations’ roles have transformed over time. One has outgrown its share of the space, while the other has felt the need to scale back, making the next move obvious. GSMA plans to close its retail store by Nov. 1, and Friends of the Smokies will convert the first floor into much-needed additional office space. “While we have greatly enjoyed having GSMA as our downstairs neighbors, we know this opportunity will allow both park partners to more effectively support the park we love,” said FOTS President Jim Hart. GSMA plans to vacate its store space by Thursday, Nov. 1. In an effort to make the move a little easier, GSMA is calling on its supporters, not to help them load the moving truck, but to attend a 10 percent clearance sale of all remaining merchandise Saturday-Wednesday, Oct. 27-31. Earlier this month the Senate Committee on Energy and Natural Resource passed The Restore Our Parks Act (S.3172), an important piece of legislation that would provide dedicated funding to reduce the National Park Service’s deferred maintenance backlog – including nearly $12 billion in needed repairs across the National Park System. The bill, introduced by U.S. Senators Rob Portman (R-OH), Mark R. Warner (D-VA), Lamar Alexander (R-TN) and Angus King (I-ME), will use revenue the government currently receives from energy production on federal lands and waters – up to a total of $6.5 billion over five years – to repair park roads, visitor facilities, crumbling trails and other structures. The National Parks Conservation Association has long advocated for this much-needed funding to address some of the most critical repair needs of America’s national parks. “We commend Congress for taking another step toward fixing our national parks. For years, NPCA has urged our lawmakers to address our national parks’ repair needs. Too many of our parks’ water systems, visitor centers, roads and trails have been neglected—not because of lack of will but because of lack of money. Park rangers have had to make due with shoestring budgets while aging infrastructure takes its toll. The N.C. Division of Parks and Recreation announced this past week the launch of the N.C. Trails website. The website is a hub for the N.C. Trails Program and offers quick and easy access to information on state trails and trails in state parks as well as guidance for funding, creating and maintaining a trail. The new website is simple, user-friendly, and provides information for grant applicants, trail users, and trail developers and maintainers. The new website goes live today, and can be accessed at http://trails.nc.gov. "We are thrilled to make this site available to trail enthusiasts near and far," said Scott Crocker, manager of the N.C. trails program. "This dedicated site will provide guidance and technical assistance for trails program grant applicants while providing detailed information and improving our trails visibility statewide." The new state trails website will be updated regularly with trail development news, project updates, volunteer and funding opportunities, milestones, and events. Users can plan hikes, learn how to get a trail segment designated, and explore expert tips on managing existing trail segments. Previously, all N.C. trails program information was housed on the N.C. state parks website, ncparks.gov. The new site was developed due to increased demand for more detailed and accessible trail-specific information. Big South Fork National River and Recreation Area will be observing Veteran’s Day on Sunday, November 11, 2018. Superintendent Niki Stephanie Nicholas has authorized a night of free camping at the Alum Ford Campground as well as for all backcountry permits during this time. Alum Ford Campground, located at Big South Fork, offers a serene camping experience near the edge of the Big South Fork River on the Kentucky side of the park. This campground has six sites available on a first come-first served basis. Amenities include an accessible vault toilet and recently renovated gravel tent pads, grills, picnic tables, food storage lockers, animal-proof garbage receptacles, and lantern hooks. The Sheltowee Trace National Recreation Trail passes through this campground providing access to the magnificent backcountry areas of the park. On Veterans Day, or any day, honor those that have served and sacrificed for our country with a visit to a National Park Service site near you. More information may be found at: http://www.nps.gov/findapark/feefreeparks.htm. I’m very excited to announce the release of my brand new book on the rich history of hiking! Ramble On: A History of Hiking is the first broad historical overview of hiking in one volume. Among the variety of topics discussed about the early years of hiking, the book also includes anecdotal stories of trail development in some of our oldest and most iconic national parks, including Great Smoky Mountains National Park. To give you a better idea of what the book encompasses, I've copied the introduction to the book (below), which is now available on Amazon. How did hiking evolve from the upper-class European sport of alpinism and the publication of an English travel guide into an activity that now has millions of participants all over the world? Who built the thousands of miles of trails that now crisscross America? What did early hikers wear, and what were some of the key inventions and innovations that led to our modern array of hiking gear and apparel? How was information about hiking, trails and gear disseminated in the early years? And what were some of the reasons why people hiked, and how have those changed over time? Ramble On, a general history on the sport of hiking (also known as rambling, tramping, walking, hillwalking, backpacking or trekking), attempts to answers these questions, as well as many others. 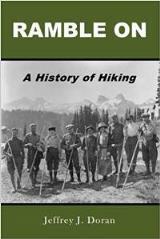 This book chronicles hiking’s roots in alpinism and mountaineering, the societal trends that fostered its growth, some of the early hikers from the nineteenth century, the first trails built specifically for recreational hiking, the formation of the first hiking clubs, as well as the evolution of hiking gear and apparel. 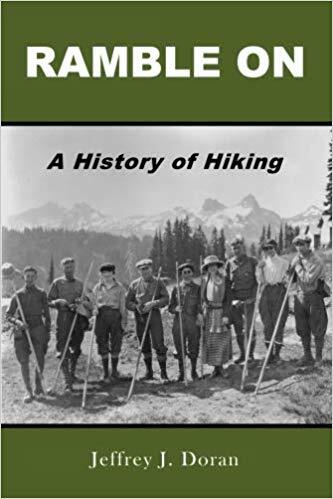 When I first considered writing this book two years ago I wasn’t really sure how much relevant information I would be able to find, or how compelling of a story could be written about the history of hiking. I feared that I wouldn’t have enough material to write a full book. However, after diving into the project I soon realized that hiking actually has a very rich and compelling history, and has been profoundly influenced by a series of events that had nothing to do with hiking. I was continuously amazed by how much hiking has been molded by societal trends, as well as national and international events. The story of hiking took me in many directions that I never would’ve considered, from Romanticism and Transcendentalism, to the Industrial Revolution and the labor movement, to the rise of automobiles, environmentalism, club culture, and even art, to name just a few. However, what intrigued me the most were the anecdotal stories of trail development in some of our oldest and most iconic national parks, as well as the peculiar and quirky traditions of some of the early hiking clubs. One of the most compelling stories was the apparel women were forced to wear during the Victorian Era, and the danger those fashion standards posed to women who dared to venture into the mountains. This book also takes a look at some of the issues that currently impact hikers and trails, such as overcrowding and social media, and takes a peek into the future on how some of these trends could unfold. I also explain some of the solutions public land managers are currently considering, and offer a few suggestions myself. My hope is that you will you come away with a better understanding of what it took to make hiking one of the most popular activities in the world, and what we need to do to preserve our trails and the spirit of hiking for future generations to come. To order your copy now, please click here. Thank you very much! Search crews located the body of Susan Clements in Great Smoky Mountains National Park late this afternoon. Her body was found approximately two miles west of the Clingmans Dome parking area and ¾ miles south of the Appalachian Trail. Our hearts are with the family and friends of Ms. Clements. The park would like to extend our appreciation to the many agencies and organizations that participated in the search effort. Further details will be provided when they become available. Great Smoky Mountains National Park officials announced last night that search crews found the body of Mitzie Sue “Susan” Clements, 53, from Cleves, Ohio, after an extensive, week-long search. Clements had been missing from the Clingmans Dome area of the park since Tuesday, September 25. A large-scale search operation was launched, which included trained searchers, canine teams, helicopters, and drones with advanced technology from around 50 local, state, and federal agencies and professional search and rescue groups. Late yesterday afternoon, Clements' body was found off-trail, in a rugged, heavily wooded area of the Huggins Creek drainage, approximately two miles from Clingmans Dome parking area and three-fourths mile south of the Appalachian Trail. The cause of death is under investigation, however foul play is not suspected at this time. Clingmans Dome Road remains closed to allow staff time to remove the infrastructure brought in to help manage and support the search operation. The road and Clingmans Dome parking area are expected to reopen by tomorrow morning.